If you are a Costco member and are considering buying Photoshop Elements 15, you may want to take advantage of this sale. It runs through November 27th. Over the years, Adobe has improved ways to organize your photo collection in the Organizer, so that you can find specific images quickly. Most notably of these, are the Views, Events, Places, and People. However, in this tutorial we will use the classic keyword tags approach to accomplish this. It shows the specific steps to take to use Categories, Sub-Categories, and Keyword Tags in Photoshop Elements 15. It also shows how to use the Organizer’s Find command. Click on the link below to read the tutorial. If you found this tutorial helpful, please rate it accordingly, and share it with your friends. 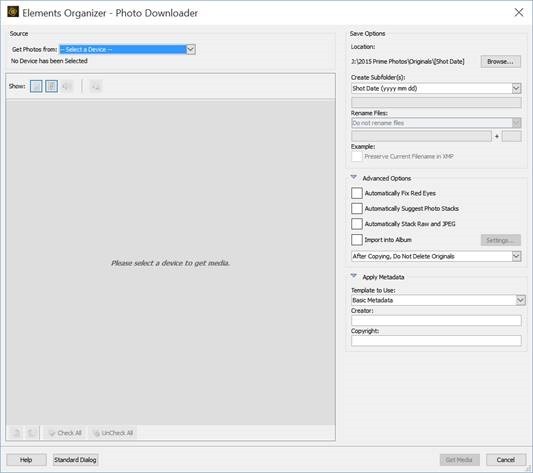 This exercise covers uploading images from your digital camera or card reader to your computer using the Organizer of Photoshop Elements. Click here to see how to import pictures already on your computer. What follows assumes that you have previously set the desired PSE preferences. To download a PDF file of this tutorial, please click here. 1. Open the Organizer of Photoshop Elements. 2. Connect your camera or a card reader to one of your computer’s USB connectors before turning on your camera or inserting your card into the reader. 3. For a camera, put it in the normal Playback mode and turn it on if required. If you are using a card reader, insert the memory card into the appropriate slot. 4. The Windows Auto Play dialog box similar to the one below may appear. If/when it does, click on the red X in the upper right hand corner to close it. 5. On the Menu bar, click on Import > From Camera or Card Reader as shown below. 6. The simplified Photo Downloader dialog may open as shown in the figure below. If it does, click on the Advanced Dialog button as shown in the figure. The Advanced Dialog is shown in the next figure. 7. You should then see a bright blue bar at the top of the dialog that says Select Your Device. Click on the down arrow and select your camera/card reader in the drop down list. PSE 15 immediately reads your card reader/camera and displays thumbnails of each of the images it finds as shown in the figure below. Note, in the figure below, I have connected my iPhone to the computer. PSE 15 treats it as a camera. Also note that for an iPhone/iPad, it displays all of the photos and videos in your Camera Roll. Also, since you will probably have far more photos on your iPhone than you want to upload, you will probably want to click on Uncheck All in the lower left of the dialog, and then click on the small square by each photo you want to upload. Note, no images have been copied to the computer yet. 8. Each of the thumbnails has a small white box just outside of its lower right corner which has a green check indicating that image will be copied to the computer. To skip any images, click on its white box to remove the green check. 9. On the right side of the dialog are the options (storage location, red eye removal etc.) that will be used during the upload process. For our purposes, we will assume that you have already set these using the desired Edit > Preferences and are satisfied with the choices shown. See the figure below. 10. Click on the Get Media button in the lower right corner of the dialog to begin copying the photos to your computer. 11. After a short time, a small brief message appears for a second or so indicating how many images were imported. The imported images are then displayed in the grid and are ready for tagging etc. 12. You can now disconnect the camera or card reader in the appropriate manner. For an iPhone/iPad, out can simply remove the device. If you found this tutorial helpful, please rate it accordingly, and share it with others. 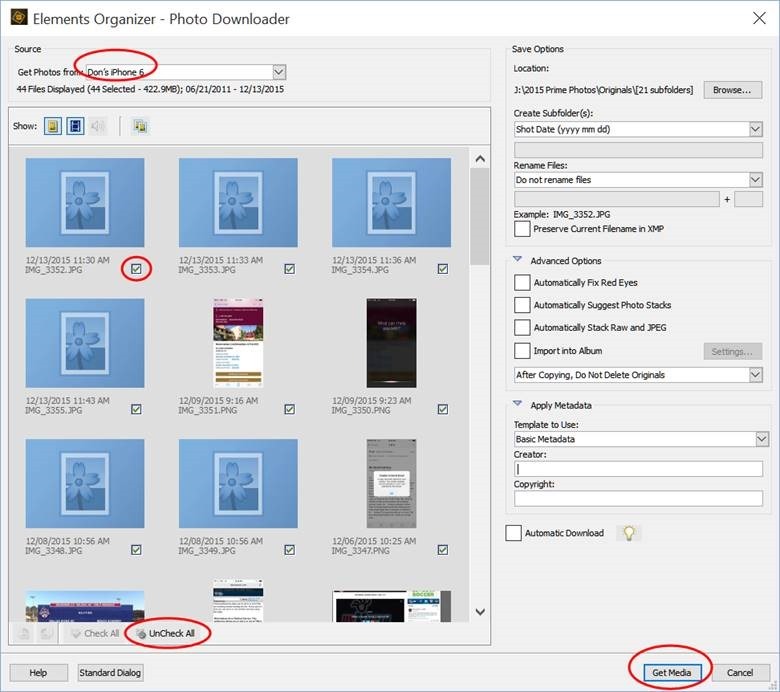 Assuming that you are just starting out using the Organizer in PSE 15 (actually any version of PSE), you are going to want to begin to populate your Catalog with pictures and videos. You are either going to want to upload new pictures from your camera or smartphone, or import pictures already on your PC. Here, I will cover the latter. Importing from your camera or smartphone will be covered later. Clicking on the figure below, will open a PDF file that describes the steps. I am using PSE 15, but the steps and figures are the same for recent previous versions of Elements. I also have a YouTube video that explains importing photos from your PC into the Organizer’s catalog. The example specifically uses a folder you created on your desktop into which you have downloaded pictures from the internet, or possibly copied pictures you received from an email. This video uses PSE 14, but again, the screens and steps are identical for PSE 15. Click on the figure below to view the video. 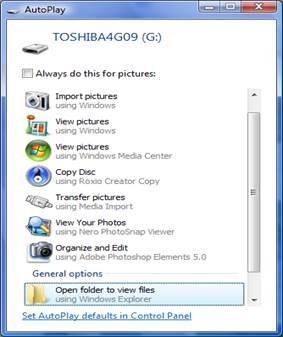 In both examples, you are just taking an inventory of what is on your computer and letting the Organizer of PSE know where the pictures are located. The pictures themselves are not moved or altered. Generally speaking you will be importing the photos contained in the Pictures folder on your C Drive. But as you have seen, the concept is the same no matter where they are contained on your PC. I will cover importing images from you camera or smartphone in a later post, so stay tuned. If you thought this tutorial was helpful and want to see more, please rate it at the top of the page, share it with friends, or better yet leave a comment with any questions etc. The Organizer’s workspace (screen) has evolved over the past few versions. One of the new features is the new search screen. This and other features are surveyed in this video. Using the various Views and features will be covered in detail in future videos and articles. If you found this video helpful, please watch for new videos and tutorials coming soon. If you are new to Photoshop Elements, or only an occasional user, you should verify that the defaults for the various options are set to your liking. Most of them can remain at their default or as-installed settings, but it is a good idea to review them anyway. 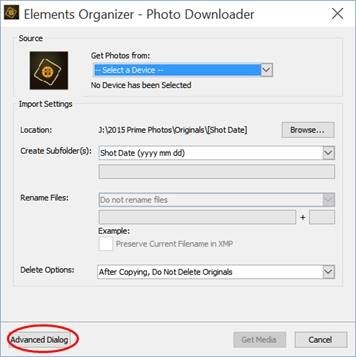 Click on the figure below to see how to check the preferences for both the Organizer and the Photo Editor. If you found this helpful, please let me know by leaving a comment below. Also, please rate this post and share it with friends if you found it helpful. When Adobe introduced Photoshop Elements 11 several years ago now, they totally redesigned the user interface, and the workflows that are used to effectively use the Organizer. One of the main additions that were introduced were Views. The views are shown at the top of the Organizer’s screen and are eLive, Media, People, Places, and Events. These views and the features they contain have continued to evolve since then. A PDF tutorial that overviews these views can be opened by clicking on the figure below. Future posts will go into more detail on using these views and their features. If you found this post helpful, please let me know with your comments and rating it.